Mozilla has been actively building the framework to enable third-party developers to build in-browser add-ons. Firefox’s Social API add-on was announced in October, and Mozilla announced today that it has launched an in-browser Facebook Messenger app for Firefox in collaboration between the two companies. 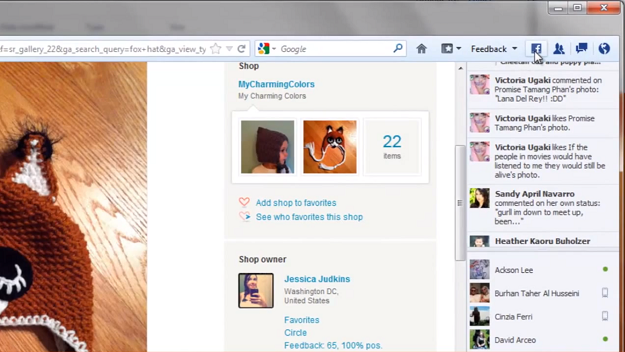 Firefox is Facebook’s latest platform that you can find its Messenger app on. There isn’t much of a discernible difference between this app and from the others that exist already. The key difference would be that Firefox users can browse The Internet as they wish without having to navigate away from Facebook Messenger. The add-on stays put in the right hand column no matter your browsing activity. At the very top of the Facebook Messenger add-on, you can have the latest updates from your News Feed in a real-time ticker, and below that keep a window open for friends that are available to chat. Like Facebook Messenger in the desktop app, the messages that you send and receive appear in a chat box that looks like what you’d find on the desktop app. Also like the desktop app, above the browser’s Facebook add-on you’ll find the familiar notification icons baked into Firefox’s bookmark. So Facebook Messenger users can transition between the desktop, Web, and browser apps seamlessly. But really there’s no reason to use more than one app. The only concern that a user might have with using the Firefox add-ons are worries over browsing habits being tracked. To these people, we’re sorry to say that Facebook tracks you browsing activity from the instant you log onto Facebook’s Web app. To install the add-on onto Firefox, first you need to have the latest version of Firefox installed, which is Firefox 17. Then on Firefox browse to Facebook’s “Messenger for Firefox” page, click on the green button and “Turn on” the add-on. Facebook published a blog post as a follow up to Mozilla’s announcement discussing the technicalities of the build. Facebook explains how the build used HTML 5 standards WebSockets and Shared Worker to do the trick. But Firefox’s social media add-on isn’t restricted to just Facebook. Mozilla is inviting other platforms, like Twitter and Google+, to also help create tailored built-in experiences for its browser. We’re not holding our breath for a Twitter add-on anytime sooner, however, for obvious reasons (hint: Twitter won’t do anything that compels you to leave it’s own site).